Bradie Tennell performs her Short Program at the 2019 Geico U.S. Figure Skating Championships. Bradie Tennell is the only lady in the field at the 2019 Geico U.S. Figure Skating Championships who has a national title on her resume, and after scoring 76.60 points to lead after the short program on Thursday in Detroit, Mich., she is in position to defend her crown. Tennell, who turns 21 later this month, opened with a breathtaking triple Lutz-triple toe loop combination to the music of “Rebirth” by Hi-Finesse. The 2018 Internationaux de France bronze medalist, who placed ninth at last year’s Olympics and sixth in the World Championships, also landed a double Axel, but got an edge call on her triple flip. She also earned a level 4 on all elements with high grades of execution (GoE) and embraces her newfound role as the event favorite. Perhaps stealing the show was the 13-year-old Alysa Liu from Richmond, Calif. 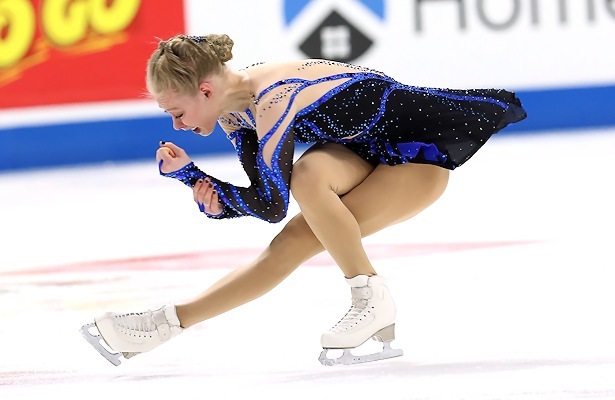 The 2018 U.S. junior champion impressed the judges in her senior debut with a stunning triple Axel, joining Tonya Harding and Kimmie Meissner as the only women to execute the jump cleanly at U.S. Nationals. Skating to “Don’t Rain On My Parade,” Liu continued to nail a triple flip. She under-rotated the second half of a triple Lutz-triple toeloop and concluded with 73.89 points to sit in silver medal contention. Her age makes her ineligible for the World Championships in Saitama, Japan, this March. Mariah Bell is in third with 70.30 points after her powerful performance to Celine Dion’s “To Love You More.” Following a double Axel, Bell under-rotated the back end of a triple Lutz-triple toeloop (Lutz had an edge call), losing 1.52 points in Grades Of Execution (GOE), but the 22-year-old landed a clean double Axel and triple flip while earning a level 4 on her straight-line footwork and combination change spin. Amber Glenn put out a near-clean routine to “Gravity” which featured a triple flip-triple toe, double Axel, and triple loop while earning level 4s on all other elements except for a combination spin. She was awarded 69.86 points. “Having been so close so many times, I thought this could be my breakthrough year,” said 19-year-old Glenn, who was eighth at Nationals in both 2017 and 2018. Hanna Harrell, 15, is in fifth (68.16) after her routine to “Bla Bla Bla Cha Cha Cha” in her senior debut. She landed a triple Lutz-triple toe, double Axel, and triple flip.